Nudibranch and cleaner shrimp. 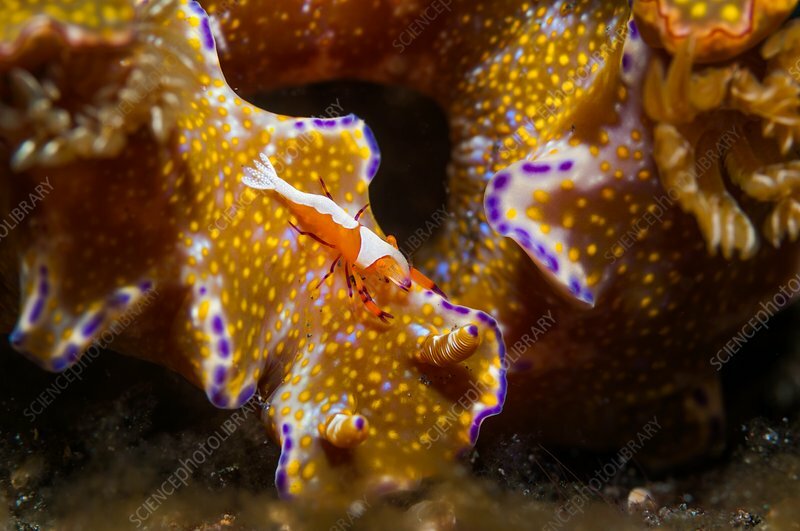 Emperor shrimp (Periclimenes imperator, red/white, centre) on a nudibranch (Ceratosoma sp., orange, spotted) on a reef. Nudibranchs, or sea-slugs, are shell-less gastropod marine molluscs that live in seas around the world. They have external gills that give the nudibranch its name, meaning naked gills. Cleaner shrimp clean parasites from other animals. In return, they gain protection from predators. Photographed in the Lembeh Strait, North Sulawesi, Indonesia.